Web enhanced, not web-dependent, the Turbo PT cloud is powered by secure HIPPA compliant protocols on fastest-in class enterprise-grade servers that allow you to access your clinical data from anywhere. Turbo PT delivers a modern and intuitive user experience. It’s easy to learn and use because it was designed by therapists, for therapists, so you can practice your way. Get more done, in less time, with less effort. Built on the same technologies that power today’s leading businesses, we give you the flexibility to grow amid industry change. Whether ICD-10 or MIPS we always keep you miles ahead of healthcare reform. The Turbo PT system is so fast and user-friendly. We are constantly updated with improved features that have helped our practice obtain significant time savings, focus more on patients and achieve greater profitability. Electronic billing with Turbo PT does the heavy lifting so you get peace of mind in this era of reform. Track patient balances, missed visits, and patients who fall off your schedule. Get visual prompts in your schedule and patient records when patients owe you money. Monitor your revenue cycle through industry standard reports, customizable reports, and alerts. Our advanced billing platform gets your paid more, faster, with less work. 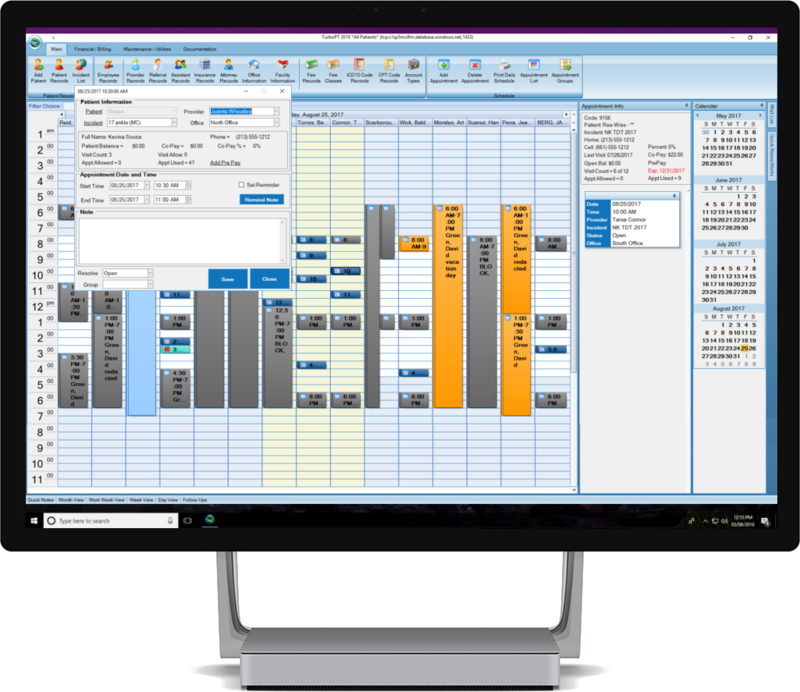 Our modern and intuitive practice management and EHR solution helps you streamline your day, so you spend less time fighting technology and more time treating patients. Automate many of the tedious tasks that can slow your practice down, and let our advanced analytics provide real time feedback on practice performance so you can easily manage your business. Turbo PT’s advanced analytics with reports gives you powerful insight into your practice’s operational and financial performance. A wide-range of customizable reports makes it easy to analyze performance over time, forecast future results, and identify areas for improvement. From daily financials to missed appointment reports, get a complete view of your patients and practice You’ll easily be able to see what’s going on in your practice and make more data-driven decisions. Create your own library of exercise programs or access Exercise Pro Live from directly in Turbo PT to access over 3000 HD videos of evidenced-based exercise along with printed programs. Sync patient information with Focus on Therapeutic Outcomes (FOTO.) You will be able to determine your patients’ functional status, report functional limitation g codes and severity modifiers, and track outcomes. TurboPT has integrated clearinghouse billing that makes it easy to submit your ERA's by a click of a button through our service or generate the electronic file to post to a clearinghouse of your choosing. Things change quickly and often in this industry, we keep pace with changes by implementing updates often. As a Turbo PT customer, you can be assured of timely updates and insights into the most pressing changes your practice may face. Turbo PT’s great Support team gets your practice up and running fast. Whether you’re transitioning from paper-based records or another EHR, our team will help you go-live quickly and easily. Our support department is responsive and agile. We know the software in and out and help clinics like yours resolve all sorts of inquiries. From scheduling to billing, Turbo PT support professionals have you covered. Still have questions? Contact us today at 1-800-628-8980 and a member of our team will be happy to answer any questions you may have.